Empire Online released these new behind-the-scenes images from Fox's upcoming Fantastic Four. While they don't show the superheroes displaying any powers, the photos give us an up close look at four young actors tapped to lead this series. MIles Teller is on top of the world right now. Having just starred in the Oscar-winning Whiplash, Teller is adding Fantastic Four to his other blockbuster franchise, The Divergent Series. I don't think playing scientist turned elastic superhero, Reed Richards will be too much of a stretch (pun intended). Kate Mara is probably most recognizable as ambitious reporter, Zoe Barnes from the Netflix original, House of Cards, but she's been on the TV circuit for a while, with notable appearances on American Horror Story, Nip/Tuck, and 24. 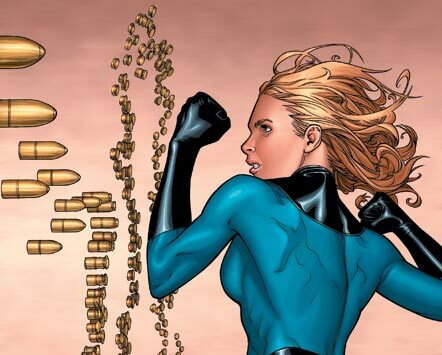 Hopefully she'll stand out as Sue Storm, The Invisible Woman. Having starred in Chronicle, Michael B Jordan isn't new to Josh Trank directed superhero movies. IN addition to his super pedigree, the actor is also known for his roles in Fruitvale Station, Parenthood, and Friday Night Lights. This time around he's playing Johnny Storm, AKA The Human Torch. While some people on the internet can't understand how mix-race families can exist, we know he'll light up the screen alongside his sister Sue. Shown above, before the accident that makes them superheroes, Jamie Bell is playing Ben Grimm, The Thing. A veteran film actor, Bell started his career young with a starring turn in Billy Elliot before continuing his career with King Kong, Jane Eyre, and the recent Korean action hit, Snowpiercer. Hopefully we'll see him in full CGI goodness soon.